I was thinking about the things I've made recently and what I actually wear the most and my linen Simplicity 2365 came to mind. I wear it often. It's sturdy, the fit is great and it's black- I can wear it with anything. I've been trying to beef up my work wardrobe lately. I've made many dresses and things that I can't actually wear to work, so I decided to make 2365 again. I need things I can wear around children and paint. This time I made view A, the longer, tunic length with 3/4 length sleeves. I lined up my pintucks with the gingham and tried to match them as closely as possible. They are almost invisible (so what was the point?) I used a shirting I bought from fabric.com dirt cheap. I think I paid about $2 a yard, so total cost of this shirt is about $6. I love it when I make something for so little! I feel I've outsmarted mass retail stores. It's all lovely french seams again on the inside. I sewed the collar on by hand to avoid the issues I had last time. Pretty straightforward and quick the second time around. This is a really nice top. I haven't had much luck with Simplicity patterns fitting properly, but this one fits nicely without any changes. I think the pintucks actually give the top quite a bit of shape, drawing it in at the bust and waist. On another note, I'm not so sure about the leggings. I wore this to work, even after I read Peter's post and all the comments about jeggings. I haven't worn leggings since I was, um-- nine?. They were comfortable, but I had a strange feeling all day-- like I wasn't actually wearing any pants at all (trousers for those of you across the pond). Not sure I'll rock them again. I also tried to be as stylishly unique as verypurpleperson and put just one different colored button on. It didn't quite translate to chic-- just art teacher crafty. I was asked several times if I ran out of buttons. I'll be putting on another white one next time I wear it. My pintucks are much better the second time around, if I do say so myself :) Not quite so organic. All in all, I do really like the top. I highly recommend the pattern. It's great for an easy going, wearable shirt-- just wear it with real pants :) Thanks for reading! I'm still on a mission to learn more about apparel fabrics. There is only one fabric store in town (I won't name it but I'm sure you can guess) and about the only thing you can get there is quilting cotton or fleece. There is the occasional higher quality linen or wool, but mainly cotton. I haven't ventured in to polyester territory at this point and not sure I will. I've used a lot of quilting cotton for clothing in the past and not all has been bad. Some cottons are softer and I firmly believe that a really cute print is a good enough reason to try and use a quilting cotton every now and then. 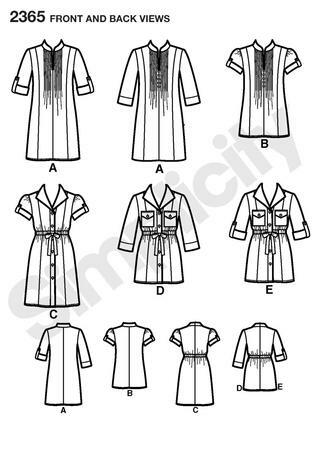 I have a button down shirt from quilting cotton that I absolutely love. But really, those cotton prints are not the best for most patterns. So I'm learning- expanding my fabric horizons, if you will. I can check linen and wool off my list. I've used linen several times and I know that I love it. I like the drape and that it is easy to sew with. I've used wool once and am using it again for my Lady Grey (and soon, silk for the lining- eek). Knits are a whole other story! I've made a few things with knits at this point and some have been good and some bad. I started with a Ponte knit when I made Simplicity 3833 which I count as a success. Thinking knits weren't so scary after all, I bought several cheapo knits and attempted other things-- none of which were successes. My pirate top was nice while it lasted-- but I've noticed that there are growing holes at every stitch. I used a ball point needle, but I think the knit was just really poor quality. Some other items I attempted from cheaper jersey type knit never made it to a finished product. I recently made a cardi wrap from a Ponte knit, but I used a straight stitch and there is not any give around the armholes. Still wearable, though. But this, my knit Kasia, is done right! I shopped around online and ordered just a little bit of this Michael Miller interlock knit. I spent more per yard than I did on my wool for Lady Grey. I originally was going to make some sort of top, but after seeing the stripes and dots in person I was dreaming of a skirt- something I could get lots of wear out of. I wanted to use a pattern where I could do something interesting with the prints and thought about the Kasia pattern. I intentionally used my normal size instead of going down a size to accommodate for the stretch because I wanted it sit a little lower on my waist. I also flared the skirt slightly at the hem. I omitted the pocket and buttons and put the zipper in the back. It's self lined-- I guess that's what you'd say. I made a whole other skirt (but took out the gathers on the side yoke pieces) and sewed it in as a lining. It's top stitched together at the hem. The knit is super soft and the double layer makes me feel like I'm wearing sweatpants. Very comfortable. I don't have a stretch stitch on my Singer (I have five stitches to choose from- think its time for an upgrade) so I used a zigzag stitch which made a difference. The seams have give and don't have that tight pull that I feel on other knit things I've sewn. And no, I'm not actually planning on wearing it with the vest in public, but my inner five year old likes the double polka dots :) It seems I have a thing for polka dots, or spots or whatever you call them. My verdict on knits is to pay the money for the good stuff. The cheap ones just don't hold up. I also prefer a heavier knit (stable knit, is that what its called?) because it is easier to sew. Also, use a zigzag stitch so the seams can stretch a little. Hopefully one day I'll have a serger and none of this will matter..... I've been researching. Or a sewing machine with a few more options. Any suggestions for sergers or sewing machines? I'm saving up for something nice! I've been busy working on my Lady Grey over the weekend. I finally picked up the muslin again and made a few changes. I took a small tuck from the lapels to keep it from gaping so much at the bust. I'm not sure it really made a huge difference. Then I lowered the armhole the way Valerie suggested. I trimmed the seam allowances to the stitching line and then stitched under about 1/8" to 1/4" at a time until the fit was more comfortable. I did this several times, so I'm estimating that it was about 3/4" all together. Quite a difference! I really need a dress form. I marked my roll line on my lapels while I was wearing my muslin and stabbed myself with pins several times and then got blue sharpie all over the shirt I was wearing. That will teach me to use a permanent marker. I decided to use my muslin as my pattern since I wasn't sure the changes I made were completely even on both sides. Since my muslin fabric has a slight stretch to it, I decided to cut it apart at the seam line instead of pulling the seams apart so I wouldn't distort the pieces. All that work just to cut my muslin in to pieces! Then I traced the muslin pieces on to my wool and added 5/8" seam allowances back in. Check out my high-tech pattern weights and sewing gauge. You know the game telephone, where someone whispers something in to someones ear and then that person whispers it to next person and so on, and so on until the original phrase is something completely different? I wondered if this was what I was doing by all this tracing and transferring, taking out and adding back in seam allowances. So I took out the original paper pattern to compare and my pieces were surprisingly accurate. Yea, me! The only major difference is the sleeve and the armhole, which is good. Where has the month of October gone?! Work has been absolutely crazy lately. I've been working really long days. By the time I get home, I'm just too tired to sew even though I really want to. My Lady Grey muslin-- yes, still in muslin form-- has been sitting neglected on my ironing board for two weeks now. I haven't touched it. I'm hoping to get some work done on it this weekend if I can stopped being intimidated by Gertie's tailoring posts. I decided that I needed to sew something fast and easy to get back in to the swing of things. I browsed around the internet for a while until I came across the zillion reviews of Simplicity 2603 on Pattern Review. I also really admired Tanitisis' version she made about a month ago. So I headed on down to Hobby Lobby to pick up the pattern and... it was out of stock. Instead, McCalls patterns were on a 99 cent sale so I picked up M5241. Looks the same, right? Hmmm. Notice that I don't have that same nice drape in front everyone else seems to have who made the Simplicity version. I did use a heavy knit so that could explain it. It's okay. I like it and I'll definitely wear it. I've always been a fan of a classic houndstooth and I like how the reverse of my fabric is grey because of the way the houndstooth is woven. I'm not sure how the Simplicity wrap is constructed but this one was super duper simple. It's basically just two rectangles and then you actually cut a hole in the rectangle to put the sleeve in. I thought that was the strangest thing, cutting that hole in the middle of a pattern piece. The armholes are a little snug, too. I may go back and fix that- or not. I like the way it looks best when it is open, but it's also fun to throw it over a shoulder, hence the label cardi-wrap. All in all, I deem it a success. I'll get lots of wear out of it now that it is finally getting cooler. 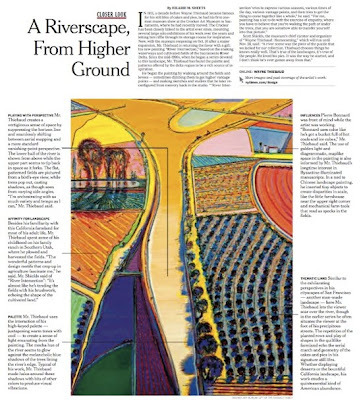 For more on Wayne Thiebaud and his beautiful landscapes, check out this slideshow or the article about River Intersection. On a side note: Wouldn't this be a great idea for an expert quilter? To make quilts based on works of art? I would love to have a Thiebaud quilt.